If you’re a more experienced manager, like me, you may sometimes feel yourself slipping into the “grumpy old man (or woman)” phase of your career. This is comparable to sitting on your porch and yelling at kids to get off your lawn, but in a work context, it manifests itself as griping about the new generation of employees. They’re all so entitled, you say. They want the world without paying their dues. They won’t work hard, and they don’t respect their superiors. I understand that feeling, and I may have even muttered something similar on occasion. But overall, I believe the rising generation of workers is going to do incredible things, accomplishing more than I can imagine and reinventing where and how people work. If you’re wondering why I’m so confident, I can sum it up in one word: Emma. Emma is my oldest child. She graduated from high school in June, and she’ll be off to college in August. And wow, is she amazing. I know this is going to sound like the bragging of a parent, but she accomplished more during high school than I did in college. She participated in her school’s International Baccalaureate program, earning the diploma. She landed top scores on standardized tests, becoming a National Merit Finalist. She participated in theater productions. She was active in her church and community. And she worked a part-time job in the food service industry. Did I mention she’s amazing? Speaking of that food service job, she loves it, and I think that’s largely due to her attitude and to her manager’s flexibility, even with the teens who make up so much of his workforce. “I like that I get to interact with a lot of different people,” Emma says. “I like that I can almost always find something to do. If I’m not busy helping customers, I can always go clean something. I love what she’s saying here. She works hard at a job she enjoys, and she works with her manager to build the flexibility she needs. Can you see why she gives me hope? Like so many of her friends, Emma has ambitious goals. She wants to earn a bachelor’s degree in civil engineering, then go on to graduate school to earn degrees in structural engineering and architecture. That last sentence is key to the next generation of workers, I think. Many of them seem focused on finding careers that will help them do something important. You can write that off as the idealism of youth, but Emma seems to be going into this with her eyes open to the realities of the world. She wants to achieve her career goals, but she also wants to have a family and strong personal life. She knows that’s going to be difficult, but she sees changes occurring that convince her she will be able to do both. My wife works as a freelance writer and editor, and I’m also (obviously) a blogger from home, in addition to working a full-time job in an office. Emma says our example shows that, even now, you can have a fulfilling career and still have time for spouse and family. And in the future, she believes advances in technology and attitude will make that goal even more realistic. “New forms of communication are being figured out every day,” Emma says, adding that video communication and virtual chat rooms are already changing how people work. Not that she thinks offices will be a thing of the past. Rather, she believes they will evolve, and she wants to help design new spaces to help people work. She also believes that companies will pay more attention to what helps individual employees be most productive. That should lead to less emphasis on the typical 9-to-5 schedule, allowing people to complete tasks when and where they can do their best work. I sincerely hope Emma’s dreams of her working future come to fruition. And while I won’t generalize about her entire generation—she warned me against that, in fact—I do see good things in the youth who will be entering colleges and universities this fall. I agree, Em. And with that, I think it’s time for me to stop yelling at kids to get off my lawn. Instead, I should talk to them and pay close attention to what they’re trying to build. They have big dreams for themselves and for the future of work, and I have high hopes that their dreams will create an even better reality. Photo credit: Greg Kratz. 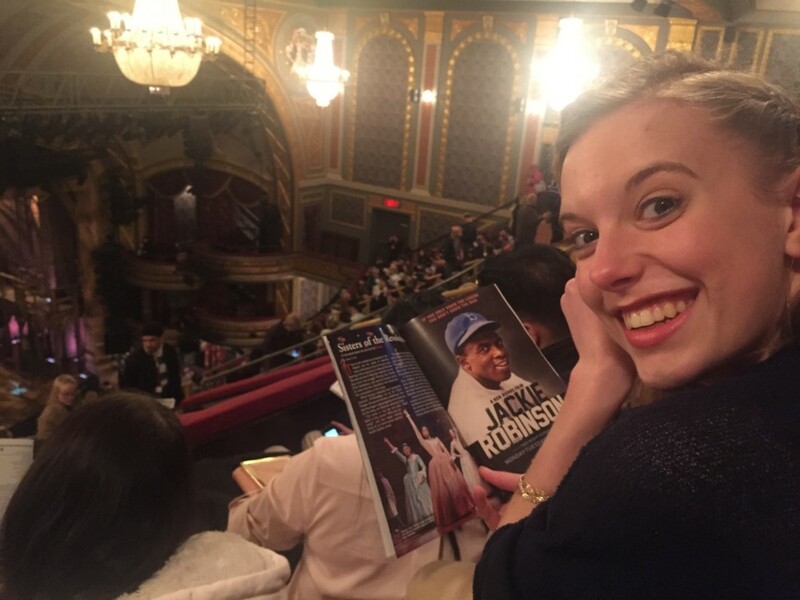 Emma Kratz watching a performance of “Hamilton” in New York 2016. A good share of credit goes to competent parenting. You and Stacey have done a wonderful job. That being said, Emma is a very talented, charming person in her own right and you have many reasons to be proud.